Oncology patients on active treatment have, on average, one hospital admission and two emergency department visits per year, and 40% to 50% of these stem from symptoms related to their treatment . Acute hospitalizations account for 48% of total cancer expenditures and considerable regional variation exists, suggesting that these hospitalizations may be avoidable. Recently, in the Journal of Oncology Practice, Handley, Schuchter, and Bekelman conducted a review of best practices to reduce unplanned acute care for patients with cancer. Reviewing guidelines by professional organizations and articles published between 2000 and 2017, the authors identified five strategies to reduce unplanned acute care: 1) identify patients at high risk for unplanned acute care, 2) enhance access and care coordination, 3) standardize clinical pathways for symptom management, 4) develop new loci for urgent cancer care, and 5) use early palliative care. At ASCO this year, investigators reported results on novel health care delivery interventions that feature these strategies. In this blog, I will highlight an abstract that advances the research for each of these strategies. These abstracts are available in the health services track of the annual meeting. 1. Risk stratification: The authors argue that by targeting interventions to those patients most at risk, rather than building capacity for all patients, organizations can make the best use of scarce resources and realize the benefits of these programs most efficiently. The potential for this was demonstrated in an abstract by Kehl et al. (abstract #6509). The researchers constructed a machine-learning framework to predict hospitalization or death within 30 days following a dose of palliative-intent cytotoxic chemotherapy using utilization data from 60 days before dose. Using SEER-Medicare linked data for 6,067 patients receiving chemotherapy for stage IV lung cancer, the model incorporated both demographic and claims-derived variables (diagnosis codes, procedure codes, drug codes, etc.). This type of framework holds the promise of identifying high-risk patients for supportive care interventions, and by expanding the variables used to predict risk and incorporating new modeling techniques, the authors provide a path toward developing more robust risk stratification models. 2. Enhance access and care coordination: The authors argue that efforts should focus on “patient-centric engagement facilitated by connected health efforts, a technique that has been described as automated hovering.” Likely the most innovative abstract at ASCO 2018 was Dr. Carrie A. Thompson et al.’s “Patient-reported outcomes, emoji, and activity measured on the Apple Watch in cancer patients” (abstract 6501). The study recruited patients with a wide range of cancers, life expectancy of >6 months, and ownership of an iPhone ≥ 5.0 and provided them with an Apple Watch. Patients were randomized into three groups for mode of survey response: paper, iPhone, and Watch. Patients completed baseline and weekly PROs for 12 weeks and patients in the iPhone and Watch group completed a daily emoji mood and ordinal scale on their respective devices. Weekly PRO survey responses varied by means of collection with paper being highest at a 76% response rate and the watch group being the lowest at 60%. Patients wore the watch for an average of 9.8 hours/day with the authors collecting 21.4 MM discrete data points from these watches. Having more steps per day was associated with less fatigue and sleep disturbance, better physical and social function, and better global physical well being. With respect to the emojis, the ordinal emoji scale had a high association with fatigue, physical and emotional well-being, and overall quality of life. 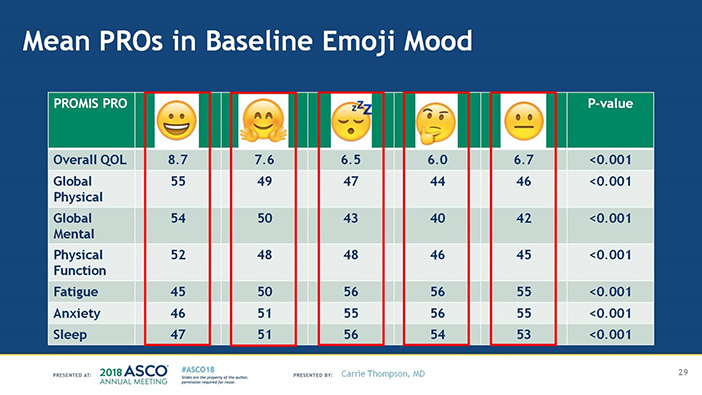 Those patients selecting the happy face emoji had better ratings on all PROs while those selecting the thinking face emoji had the lowest quality of life and the highest anxiety scores. The authors’ study demonstrated that by leveraging the capabilities of smart phones and wearable devices, including activity trackers and emojis, we can reduce the burden of collecting PROs from both the patient and provider standpoint. Presented By Carrie Thompson at 2018 ASCO Annual Meeting. Used with permission. 3. Symptom pathways: For strategy 3, the authors argue that standardized acute symptom management pathways can reduce unwanted variation in care leading to reduced acute care utilization. An abstract presented by our group at Memorial Sloan Kettering looked at this question in the setting of symptom clusters (abstract e18509). In patients who are undergoing cancer treatment, and who present to urgent care for uncontrolled symptoms, there are often multiple symptoms co-occurring. Our abstract asked how do these symptoms relate to one another and is it possible to better define clusters of symptoms in patients experiencing treatment toxicities and disease-related symptoms? We developed network visualizations to summarize our findings, which include the frequency of individual symptoms, the strength of co-occurrence among symptom pairs, and the identification of symptom clusters. Current pathways for symptom management are designed to address a symptom in isolation and fail to recognize the complexity of co-occurring symptoms. By elucidating these clusters we can further our thinking around developing pathways that are reflective of the patient experience and thus improve our symptom management strategies. 4. New loci for urgent care: Handley et al. note that patients with cancer who present to a general ED for urgent care are often subsequently admitted to the hospital and there is a strategic need for new loci to evaluate patients with worsening symptoms. In this vein, Kapke et al. (abstract 6544) presented the results of a 24-hour cancer clinic staffed by oncology trained providers and offering around-the-clock access to patients for a variety of urgent care needs. They evaluated resource utilization, admission rates, patient satisfaction, and cost for patients seen in the 24-hour cancer clinic compared to the ED. There was 56%, 32%, and 11% less imaging, ECG, and lab utilization, respectively, for patients seen and discharged from the 24-hour cancer clinic compared to the ED, resulting in a lower median charge per patient. In addition, the admission rate from the 24-hour cancer clinic was 18% compared to 42% from the ED, and the clinic had an 89.7% top box score (9 or 10 on a 1-10 scale). This new loci was thus achievable across the spectrum of outcomes measured. 5. Early palliative care: Finally, the authors argue that data regarding the ability of early palliative care to reduce unplanned acute care is robust. However, despite this foundation, physician discussion of treatment goals or referral to palliative care still persistently occurs late in the disease setting. Adelson et al. presented on their development of a dashboard for end-of-life care at Smilow Cancer Hospital at Yale-New Haven (abstract 6590). Collaborating with Flatiron Health, they generated automated reports with internal benchmarks across various measures of end-of-life care at the individual physician, disease team, and practice site with patient-level detail. These types of dashboards can thus identify performance outliers among the physicians and opportunities for care improvement interventions in palliative care. Most of the research presented focused on one or two of these strategies, while the ideal would be an integrated program incorporating all five strategies. However, the research presented advances the work toward building a better care-delivery system for our patients.